Our roots are in France, within the crowded factory town of St. Quentin. It is there that our founder was struck by the injustice of poverty and social neglect. His dream was to establish a community committed to continuing Christ’s work of building God’s kingdom of justice and love. Dehonian priests and brothers have carried the founder’s dream around the world. We are now found in over 40 countries on five continents with our most recent initiatives in places such as Angola, Chad, the Philippines, India, Vietnam, Albania and Ukraine. On the feast of the Sacred Heart Fr. Dehon makes his first profession of vows; the congregation begins. The first house of the congregation, Maison du Sacré-Coeur, is established in St. Quentin, France. It was the seat of the General Curia until 1903. The first priest, Fr. Ernest Jacques Herr, is ordained for the congregation. The first house outside of France is established at Sittard (Netherlands). It was an international novitiate and apostolic school. The congregation is suppressed; three months later, on March 29, 1884, the Holy See grants authorization to reestablish the congregation but under a new name: “Congregation of the Priests of the Sacred Heart of Jesus” (Prêtres du Sacré-Coeur). The first general chapter is held in St. Quentin, France, at St. John’s College. Frs. Grison and Blanc are sent to Ecuador as the congregation’s first missionaries. However, the mission did not take hold and the missionaries were forced to leave. The congregation returned to Ecuador in 1997. Ministry begins in northern Brazil; the first house is established in Camaragibe (Pemambuco). Frs. Grison and Lux sail to the Congo, arriving in Stanley Falls on October 17, 1897. In the midst of civic anti-clericalism, the French government dissolved its recognition of Catholic religious orders, including the Dehonians. On April 4 the Holy See granted permission for the congregation to transfer its General Curia from France to Brussels. The Holy See approves the congregation definitively, and its Constitutions for ten years. The General Council accepts the mission of Finland; however, only four years later its missionaries were forced to leave as all foreign-born priests were expelled by the government. In 1921 the Dehonians were able to return to Finland and continue to minister there today. The congregation begins ministry in Italy with the opening of a school in Albino. The congregation divides into two provinces: the Western and Eastern Provinces. Four SCJs go to Canada to begin the congregation’s presence in North America. The first house is established in Wainwright, Alberta. This initial effort stalled after a few years but the congregation returned to Canada in 1948, focusing on ministry in Quebec and Ontario. The congregation requests permission from the Holy See to start a mission in Cameroon. German SCJs began ministry there in 1912. The Western Province is divided into two: the Dutch and the French-Belgian Provinces. The Eastern Province becomes known as the German Province. German SCJ missionaries go to Spain. The first house of the congregation is established in 1919 in Puente la Reina, Navarra. Fr. Fohrman of the German Province goes to the United States to raise funds for the German Province. In 1923 he accepts a mission in Lower Brule, SD, and establishes the first SCJ presence in the United States. The Dehonians continue to minister there today. The Italian Province is created; previously Italian SCJs had been a part of the French-Belgian Province. The Holy See gives final approval to the SCJ Constitutions. The apostolic prefecture of Benkoelen on the island of Sumatra is established and entrusted to the Dutch Province. This is the congregation’s first entry into Asia. Fr. Leo John Dehon dies in Brussels. The size of the congregation at his death is 696 members plus 76 novices. The General Curia is transferred to Rome. The former Columbus College in Chamberlain, SD, is purchased by the congregation. 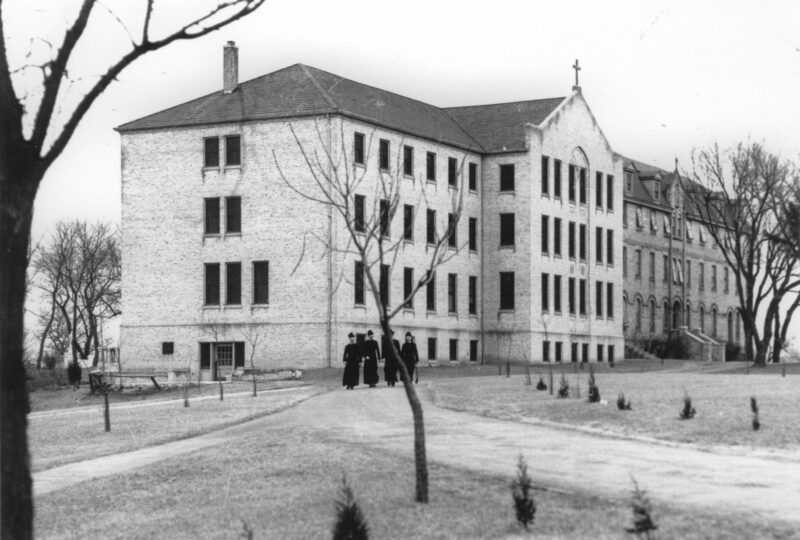 It is renovated and becomes St. Joseph’s Indian School, which continues to operate today, with ministries that expand well beyond the school’s campus. With the opening of a house in Cracow the congregation enters Poland. Sacred Heart Monastery is dedicated in Hales Corners, Wis. (suburban Milwaukee), by Msgr. Traudt. The French-Belgian Province is divided into the French and the Belgian-Luxembourg Provinces. The Finnish Region is erected and placed under the jurisdiction of the Dutch Province. In 1997, jurisdiction moves to the Polish Province. North American Province and the South Brazilian Provinces are established; they were previously under the jurisdiction of the German Province. The congregation establishes a presence in England. Dehonians take root in Argentina. Although two Spanish SCJ priests had been in the country since 1936 it was in 1938 that the congregation officially sent two groups, one Dutch and one Italian. The North Brazilian Province is established. The congregation accepts a parish in Montevideo, the first SCJ presence in Uruguay. St. Joseph’s parish in Holly Springs is entrusted to the Priests of the Sacred Heart; it is the first Dehonian ministry in Mississippi. Now the congregation serves in five northwestern counties of the state through Sacred Heart Southern Missions. Three new provinces are established: the English Province, the Spanish Province and the Polish Province. Italian SCJs begin ministry in Mozambique. The congregation establishes a school on the island of Madeira in Portugal. Later that year the first SCJ house is established in Lisbon. The US Province sends its first foreign missionaries to Africa. The congregation officially begins ministry in Chile; SCJs had been in the country since 1948. The first SCJ house is established in Venezuela (Caracas), by two Spanish priests. The congregation continues to minister there, continuing to live among the people as they face some of their country’s most difficult political, economic and social challenges. Fr. Joseph DePalma of the US Province is elected as the fifth superior general during the 14th General Chapter. He was the first and only member of the US Province to serve as superior general. The Italian Province is divided into two (North and South). Two vice-provinces are created as offshoots from the North American Province: the Anglo Canadian and French Canadian Vice Provinces. The Indonesian Vice Province is created as an offshoot from the Dutch Province. The Province of Congo is erected, though Dehonians had already served in the country since 1897. 27 Dehonian missionaries are killed during uprisings in Congo. However, the congregation has continued to be with the people of Congo throughout years of civil unrest. The Portuguese Province is erected, separated from the jurisdiction of the North Italian Province. The new Sacred Heart Monastery/Sacred Heart Seminary and School of Theology campus is dedicated in Hales Corners (Milwaukee), Wis. The congregation begins ministry in Scotland (Kilwinning). Our Lady of Guadalupe parish in Houston is entrusted to the Priests of the Sacred Heart; it is one of the oldest parishes in Houston. Dehonians go to Lesotho to run a technical school in the southern African country. The Holy See approves the text of the new SCJ Constitutions, drafted in accordance with the norms of the Second Vatican Council. The English as a Second Language program (ESL) is established at Sacred Heart Seminary and School of Theology. Hundreds of students from around the world, including many who serve in leadership positions today, are alumni of the program. Polish SCJs begin ministry in Croatia. Maison Dehon, the first AIDS hospice in Quebec, opens. The first feast-day Mass is held at the Sacred Heart Shrine on the grounds of Sacred Heart Seminary and School of Theology. The first SCJs arrive in the Philippines. Polish SCJs begin ministry in Belorus. Polish SCJs begin ministry in Moldova. Dehonians from the South Italian Province begin ministry in Albania. The Province of Chile is established, separated from the jurisdiction of the Dutch Province. The Mozambique Province is established, separated from the jurisdiction of the North Italian Province. An international General Conference of the congregation is held at Sacred Heart Monastery in Hales Corners. The SCJ presence begins in India. The regions of Aliwal and De Aar merge to form the South African Province. The SCJ presence in these two regions had been under the jurisdiction of the German Province (Aliwal) and the US Province (De Aar). The Cameroon Province is erected, separated from the jurisdiction of the French Province. The Austria-Croatia Region is erected, falling under the jurisdiction of the German Province. Polish SCJs begin ministry in Slovakia. Polish SCJs begin ministry in Ukraine. The District of India is established, and the French and Luxembourg-Walloon Provinces merge to become the Franco-European Province. The Philippine District is erected. Blessed Mariano Juan de la Cruz García Méndez, an SCJ priest killed during the Spanish Civil War, becomes the first Dehonian beatified. The two provinces of Canada merge to become the Canadian Region. Dehonians begin ministry in Angola. The Venezuelan Region is erected as an entity separate from the Spanish Province. Dehonians establish a presence in Vietnam. The congregation begins ministry in Paraguay. The congregation begins ministry in Chad; the presence falls under the jurisdiction of the Cameroon Province. The SCJ wing of Sacred Heart at Monastery Lake opens. The public apartments at Sacred Heart at Monastery Lake are opened for rental to those 55 and above. Fr. Heiner Wilmer, SCJ, is elected the 10th superior general of the Priests of the Sacred Heart. Fr. Edward Kilianski, SCJ, is elected as the 15th provincial superior of the US Province of the Priests of the Sacred Heart. Fr. Francis Vu Tran, SCJ, former member of the US Province, is named district superior of the Vietnam District of the Priests of the Sacred Heart. SCJs from around the world lead youth groups to Poland for World Youth Day. Prior to the official activities, hundreds of Dehonian youth spent time together, hosted by the Polish Province. Dehonians in Canada sponsor a Syrian refugee family in Ottawa. Archbishop Christophe Pierre, apostolic nuncio to the United States, is the main presenter at SHSST’s Dehon Lecture.